Cro-dough croissant donuts by San Rafael's Johnny Doughnuts. One of the most beloved of the so-called "food holidays," National Donut Day falls annually on the first Friday of June. While it's not recognized as an actual federal holiday, it is an easy excuse to stop by Krispy Kreme or Dunkin' Donuts for a freebie — or, better yet, to patronize one of the Bay Area's standout independent shops today. In the North Bay, San Rafael's Johnny Doughnuts offers a large selection of classic and experimental glazed, old fashioned, fritters and Bismark donuts, plus a credible take on New York's popular cronut (croissant-donut hybrid), here called the Cro-Dough. The business has a roaming food truck and will soon add a second to the mobile fleet; find the original truck on Friday from 5-9 p.m. at Off The Grid's Lake Merritt event in front of the Oakland Museum (1000 Oak Street). Dynamo Donut + Coffee encapsulates San Francisco's culinary sense of adventure with flavors like molasses Guinness, passionfruit milk chocolate, and cornmeal rosemary cherry. 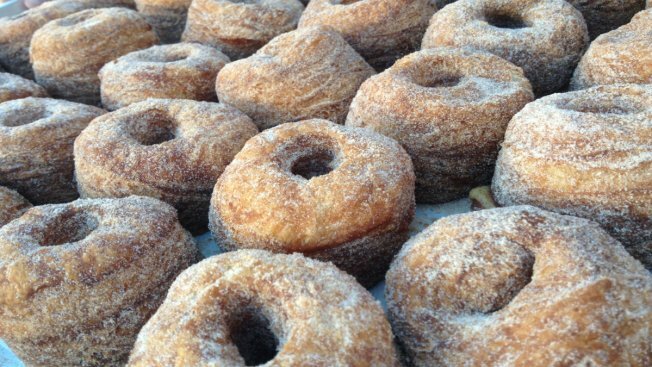 Established in a Mission storefront with a lovely garden, Dynamo has since added a donut kiosk at Crissy Field. The East Bay has seen some quality donut debuts over the past couple of years, most notably Doughnut Dolly, named for the female Red Cross volunteers who cheered up soldiers in Vietnam. The specialty here are sugar-coated donuts with rotating filling flavors and the signature "naughty cream," a custard made with crème fraiche. The shop originated in Oakland and has since expanded to Berkeley. The craziest sinkers in the South Bay live at Psycho Donuts in Campbell and San Jose, which carries donuts with names like Dirty Turtle (cheesecake, Oreo dust and caramel) and Marla (Butterfinger candy and peanut butter) as well as ones bigger than your head. Both shops will be giving out free pina colada donut holes on Friday while supplies last.